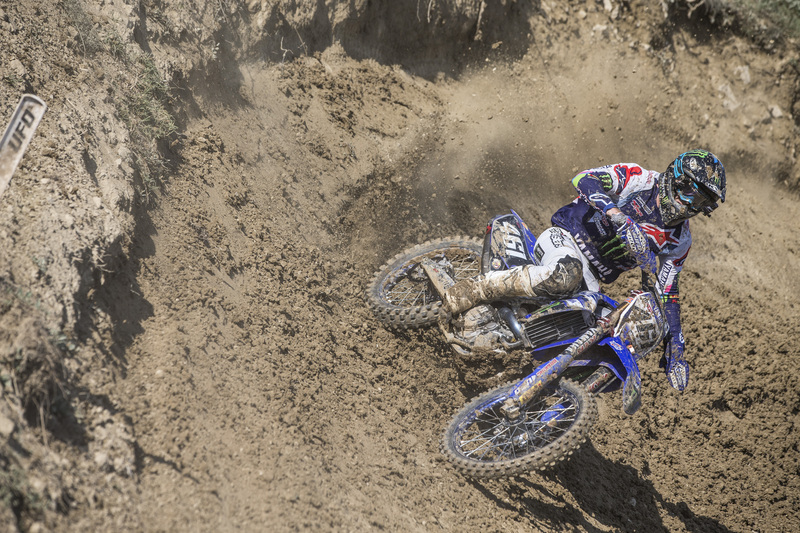 A decent crowd out on the hills of Sevlievo, Bulgaria, witnessed some of the toughest racing this season as Monster Energy Yamaha Factory MXGP’s duo of Romain Febvre and Jeremy Van Horebeek pushed hard to finish fifth and eighth overall at the seventeenth round of the FIM MXGP World Championship, while Wilvo Yamaha Official MXGP’s Jeremy Seewer and Shaun Simpson overcame the adversity they faced to finish ninth and seventeenth in the overall classification. Powering their YZ450FM’s off the start-line and around turn-one, Monster Energy Yamaha Factory MXGP’s Romain Febvre and Jeremy Van Horebeek made up the top-seven on the opening lap of Race 1. Max Anstie fell from fourth position, which allowed both riders to gain one more position before the end of the lap. In fourth-place, Febvre set his sights on the rider he wishes to surpass in the MXGP Championship Standings, Clement Desalle, but as they were running similar lap-times, he had no choice but to patiently await a mistake. That error never arrived and the ‘461’ was forced to settle for fourth, while his teammate Van Horebeek put in a strong ride for sixth-place. Wilvo Yamaha Official MXGP’s Jeremy Seewer got off to a strong start but fell on lap two when he misjudged a deep rut and threw himself off balance. The Swiss talent dropped back to sixteenth-position, but made a remarkable recovery to finish in tenth position, ahead of his teammate Shaun Simpson who had put in a respectable performance for eleventh-place. With temperatures rising well above 30 degrees Celsius, the hard-packed and steep layout of the Sevlievo circuit was physically demanding. The long up-and-down hills had the riders using different muscle groups, and combined with the sweltering heat, it proved a tough test. After exerting a serious amount of energy in the opening race of the weekend, Febvre was forced to dig deep as he went bar-to-bar with Max Anstie and Glenn Coldenhoff in an intense battle for fifth. Despite having a small crash, the Frenchman managed to make a return and triumphed the battle for fifth. Van Horebeek, Simpson and Seewer were reminded that crashes and bad-starts are an inevitable part of professional motorcycle racing with the trio being caught in a first-turn incident. Van Horebeek and Simpson fell in the event, while Seewer managed to keep his YZ450F on two-wheels but was forced to fight forward from the back of the pack. Proving he has the heart of a champion, Seewer impressively strung together a series of quick laps to move up into tenth-place, while Van Horebeek edged his speed to get back to thirteenth. Simpson’s misfortune continued with another heavy fall down one of the steep descents. The ’24’ twisted the ‘bars on impact, but decided to continue the race for training purposes where he managed to still finish in twenty-second position. The next round of the FIM MXGP World Championship will take place in five days time, on the weekend of September 2nd, at an all-new track and location, in Afyon, Turkey.